A few weeks ago I received an email from Ali titled simply "Cancer". Something felt wrong even before I opened the mail, but I would have never guessed what I read. Dan, my good buddy from college, about the same age as myself, fit, healthy, smart, recently married and about to receive his PhD, was diagnosed with cancer. Dan and Ali actually found out the news on Friday December 28, 2007 and have been in and out of the hospital with scans, tests, and doctor visits ever since. The name of the cancer is Seminoma, Stage II testicular cancer (Lance Armstrong had testicular cancer) and is actually most common between the ages of 15-34 years. Testicular cancer has a very high cure rate especially if it has not metastasized. Unfortunately, Dan's cancer had significant lymph node involvement and he'll have to undergo both radiation and chemotherapy. Dan started chemotherapy January 28 and has been documenting his journey here. 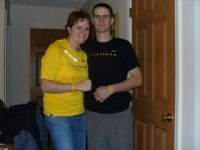 He and Ali purchased Livestrong shirts and bracelets and don't plan on removing the bracelets until he is cancer free. Dan, we're thinking of you, you'll conquer the cancer, and keep up your great attitude.